This review is aimed at parents of babies or toddlers who would probably avoid going on the London Eye with their children. Here's all you'll need to know. Further information on all these points is available below. 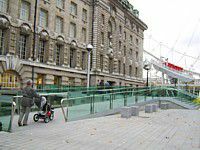 The main entrance of County Hall, where the London Eye ticket office is located, has steps so go round to the side to the Disabled Entrance so you can get in with your buggy (see the photo). Once in the building turn right, which takes you to the main entrance, then left along the corridor to the two disabled toilets with baby-changing facilities. Always best to get toilet stuff out of the way first. By the Priority Boarding Desk, staff will store folded over-sized buggies. You will be given a ticket to collect your buggy after your turn on the Eye. If you have a travel buggy that folds down small then you can take it on with you but it must be folded. If you have a newborn in a car seat on wheels type of buggy then that's fine to take on but the wheels section must be folded. Baby can stay in the car seat or in your arms/in your own baby carrier/sling. Do not take too much 'stuff' with you for your trip as there are no lockers and you cannot leave any bags with the buggy in storage. It's over-sized buggies only. You can book standard flight tickets or just walk in and queue for a ticket. These are great options if you don't have children, but standing in those queues with a baby or toddler isn't that much fun. Queues can be long, and children do not always understand patience. We would recommend spending a bit more and going for the Fast Track option. This gives you a speedy check-in, plus you're escorted past the queues outside, straight onto the London Eye at your allocated time. Once your Fast Track host has escorted you to the security team, your bags will be checked so it really is advisable to not bring too much with you. And remember for everyone's safety, no sharp items are allowed on board. The London Eye doesn't stop to let passengers on and off – it simply goes at a constant slow speed (0.26m/0.85ft per second). There is a wide entrance to each capsule but do ask for help if you are concerned about boarding while carrying small children. Once in the capsule, there is a long seat in the middle. Most people want to stand up and check out the views so take a moment to put your bags, and folded buggy, under the seat at one end and get comfortable. The flight takes 30 minutes so there's no need to rush to the windows. When you're ready, stand up and enjoy the views. If one end of the capsule is busy, head to the other end. You won't miss out as you're moving around a wheel so you'll get that view later. The interactive tablets are fun to find out what the buildings in the distance are called but you'll have to lift young children as they are positioned for adults to use while standing. No food or drink is allowed in the capsules so don't try and feed children. It's only a 30 minutes flight so they can wait! Just make sure they're fed and changed before boarding. There's a cafe in County Hall, next to the Priority Boarding Desk. Or, if that's busy, don't try and go in the All Bar One or the Slug & Lettuce on Chicheley Street as they do not allow children inside (over 21s only). Instead go down the road behind County Hall, Belvedere Road, where there are a few suitable cafes. There are a few steps to enter them but ask staff and they'll come out and help you. If you'd like to stay on the South Bank and have views of the London Eye and Big Ben, then check out the deals at the Marriott County Hall. Is the London Eye Worthy of Your Travel Spending?